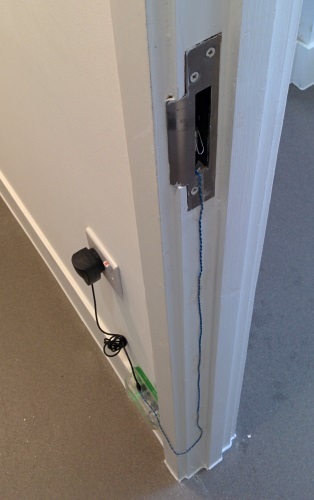 I’ve made an updated version of my Spark Core Shower Room Door Sensor that adds a Raspberry Pi driving a Blinky Tape (RBG LED strip) to show the occupancy status. It still uses the paper-clip switch (I’ll write up how to make a micro-switch out of office supplies in another post) with a Spark Core to do the sensing and sends the data over the wireless network. 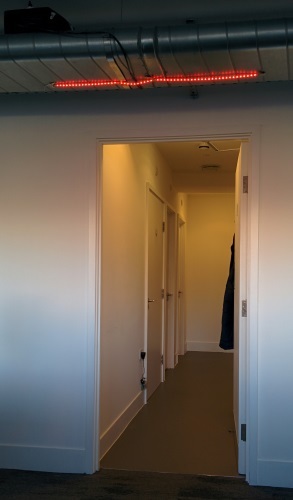 During an office refurbishment I got the electricians to install a power socket right outside the shower room door which makes installation a snap. That’s at least 8 chips just for one LED not counting steps 5-7 which is hard to measure. They could be eliminated by running the local Spark cloud on the Pi (or preferably a Pi v2). This would have the advantage of reducing latency (not that it’s that bad) and more importantly stop GCHQ perving on our bathroom habits. 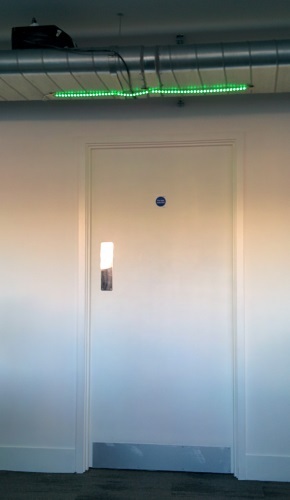 Notice how close the door and LEDs are to each other even though the data goes 1000s of kms (just like your iMessages). If you liked this then why not follow me on twitter so you hear about new articles.